This next strip comes from Warren Frantz of Off Season, a fellow crazy Canuck who shares our love of poutine (and has a heckuva love of his own for hockey). Check him out! I’m not sure if it’s intentional, but it reminds me of our short lived cooking segment, in which we made the Heart Failure, a disgusting concoction I invented for a Tips for Immortals with the sole purpose of sounding disgusting. Good times :). Poutine paste? It looks beautiful. Thanks for reminding me I haven’t tried making heart Failure yet. It really does. Going to have to do another cooking show and make it. Ha, you should definitely make it. The Heart Failure was surprisingly tasty. I do remember the Tips For Immortals strip, but it did not realize you did the video. You guys rocked that kitchen! 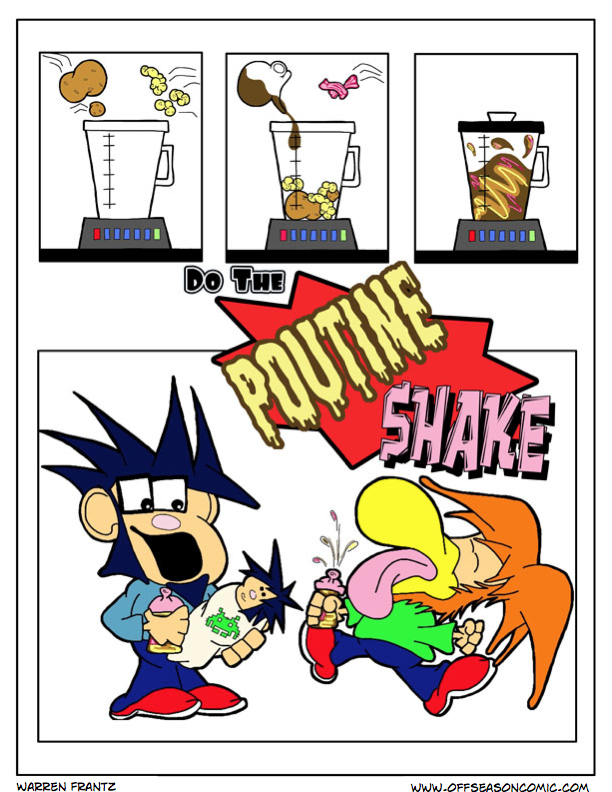 That would be so awesome if you gave the Poutine Shake the same treatment! Very seriously considering doing that, Warren. It would be delicious.